If you have limited space to grow vegetables, a raised bed garden is an ideal solution. You can grow healthy and tasty vegetables with less work than with a traditional vegetable garden. The following are some great reasons why a raised bed vegetable garden is an attractive consideration. If you live in a condominium with a small yard you can design a raised bed in proportion to the space available. Constructing a raised bed garden eliminates digging a garden patch and removes the worry of encountering an abundance of rock or poor soil. You only have to fill your raised bed garden with enriched fertilizer soil and compost. If you have back problems or trouble bending or stooping; sit on the edge of your raised bed while you work. Locate your raised bed so you have a perimeter around all four sides. This allows you ease to reach any part of your garden when planting vegetables or removing weeds. A perimeter also allows access to your garden if you are confined to a wheel chair or using a crutch. Vegetables in a raised bed garden get more sun, air circulation, and better use of water. A raised bed garden is designed to have excellent drainage and water will not pool up around the roots causing root rot. Because you reach in to work on your garden and not walk in your garden, soil will not become compacted when it becomes muddy from rain or when you water. Plus your boots remain clean. Soil warms faster in a raised bed garden so you may be able to plant earlier in the spring than you normally would. However, do keep in mind as the temperature increases and the hot days of summer arrive to water frequently when the soil becomes dry. Now that we know some of the advantages of a raised bed garden and decide this is our garden of choice; we are ready to plan our garden design. There are many building materials you can use such as wood, plastic (usually from recycled materials), bricks, and cinder blocks to name a few. Wood is the most popular and my choice of material. Be careful not to use pressure treated lumber or creosoted railway ties because the chemicals used to treat the wood may leach into the soil. A good choice is cedar wood, which is also rot resistant. Choose a location that gets the most sun. Vegetable plants need at least 6 hours of sunlight to grow and be healthy. Orient your raised bed in a north south direction so that your vegetable plants get equal amount of sunlight on both sides of your raised bed. Planning a vegetable garden requires some thought and the same holds true for your raised bed garden. After you decide on location for your vegetable plants you need to know the size of real estate your raised bed garden will use. An ideal measurement would be four feet wide by six feet long and a depth of between eighteen inches to twenty-four inches. These dimensions will allow you to reach any part of your garden when tending your vegetable plants, and high enough you can sit on the edge while doing your work. To better visualize the location in your yard and the space your raised bed will take, use either twine, rope, or spray paint to mark out the perimeter design. Check with your local garden nursery or a garden center such as Lowes or Home Depot for building plans you can purchase. For ideas on types and design of raised beds, a great source would be landscape and garden magazines. Also, try the internet and search for companies who has pre-made raised beds. You just follow the enclosed instructions from the manufacture to put it together. Some manufactures offer raised beds that interlock together without using tools and can be taken apart should you decide to move. A few tips to keep in mind when building your raised bed garden. If you choose a location where there is grass, remove the sod before you build your raised bed. This will eliminate any future problems of grass growing underneath your raised bed. To prevent a muddy walkway caused by heavy rainfall, dig a trench around the perimeter of your raised bed and fill with loose stone or gravel. Fill the raised bed with rich high quality topsoil. A lightweight soil that holds nutrients and moisture, yet drains well, are essential for good results. Check with your local nursery for advice on the best soil to use. The Nursery adviser would be happy to suggest the right fertilizer and compost for your vegetable plants, so be sure to ask and be prepared to tell the adviser what kind of vegetable plants you intend to grow. If you are not sure check back when you have made a decision. When you fill your raised bed garden with soil, you must let it settle. This may take a few weeks or more, then add soil as needed to compensate for shrinkage. You may notice over the fall and winter the topsoil will continue to settle. This is normal, just top up with more soil. If you are interested in building your own raised bed garden, we have an article raised bed construction which show you with step by step instructions including pictures how to build a raised bed. bottom, this container bed is designed to have an overflow hole on the side. There is a false bottom inside the bed separating the soil from the water reservoir. At the top of the garden bed is a plastic tube connected to the water reservoir. You fill the water reservoir via this tube and access water will flow through the overflow hole. The idea behind this design is the roots of your vegetable plants will grow through the holes of the false bottom to receive water nourishment and the soil at the bottom of the bed will absorb water from the holes in the false bottom. To better visualize this concept, many people have a saucer under a flowerpot. Water placed in the saucer is absorbed or wicked up into the flowerpot soil. I am sure at one time or another we all have done this with our indoor flowers, or perhaps still do. Anyway... This is the idea behind the design and is definitely worth considering as an option especially if you have very limited space such as only a balcony area. Self-construction kits of this design are also available from vegetable container manufactures advertising on the internet. 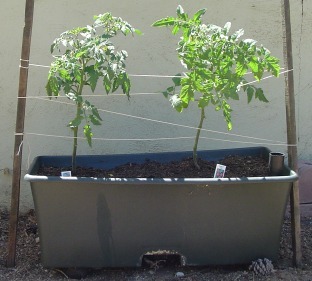 The string in the photo is used to support the tomato plants as they grow. 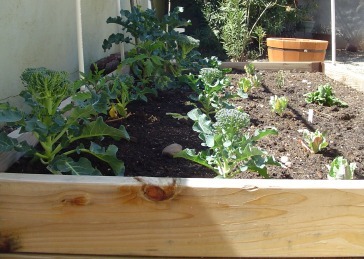 A good time to build your raised bed vegetable garden is during the fall. Planning a vegetable garden this way, will not only give the soil a chance to settle but will also give you a head start for planting vegetables when spring rolls around. Before you fill your raised bed vegetable garden with topsoil and compost, use a fine wire mesh or gravel to prevent your soil from washing away. And if you make your own compost, be sure you do not use clippings from disease plants or vegetables from the previous year, because the spores will not be affected by the cold temperatures of winter and will be waiting to infect your new vegetable plants when spring arrives. Now that we know how to build a raised bed garden, and if you did so over the fall months, you now have plenty of time for planning your vegetable garden with vegetable plants you love. Be creative with your choice of vegetable plants and experiment a little. If you have not done so on an earlier trip to the Nursery, check with their adviser to find out which vegetables are best suited for your zone. Here are a few vegetable plants that come to mind you can try. Beans, beet, cucumbers, eggplant, peppers, radish, salad greens, and tomatoes. As I mentioned before, check if any or all of these suggestions will thrive in your area zone. What is a weed? To many people they are different things. My take on this is simple. If I find a plant growing in my garden I don't like, I look upon it as a weed and "out it must go." I have precious space to grow my vegetables, and any intruder is not welcome! Fortunately, a raised bed garden makes it a whole lot easier to remove weeds than your traditional garden. You can cultivate the soil with a trowel to remove them, or moist the soil with a little water and remove them by hand. The soil in your raised bed vegetable garden is not that deep so there will be very little resistance when you use a trowel compared to traditional gardening. Because your bed is only four feet wide, you can reach any part of the garden with ease and you can sit on the edge while you do your work. These two reasons alone make a convincing argument in favor of building a raised bed garden. Even though your weeding process is a whole lot easier with a raised bed garden, there is still room for improvement by mulching. Not only does mulching dramatically reduce weed population, it also conserves soil moisture, keeping the soil at a uniform temperature and preventing soil erosion. We have covered a lot of information in planning a vegetable garden, planting our vegetables, and looking after them with tender loving care. Be sure to keep a close eye on your plants for any signs of insects looking for a tasty treat. development of disease on top of your plants. This is especially true of your tomato plants. It would be a good investment of your time to check with your local nursery adviser for advice on preventive measures for these problems. Now it's time to sit back, relax, and enjoy your raised bed vegetable garden. I'm sure you will be excited with your vegetable crop at the end of growing season, and receive praise from your family for a job well done. If you would like more information on raised bed gardening you may want to read more information from Missouri University Education dept.